OXFORD, UK --- Airbus Helicopters UK has defied market conditions with a new high of 14 civil aircraft booked in 2017, demonstrating a year-on-year average growth in the civil market of 36% since 2013. As a result, the company has reinforced its position as UK market leader with 46% of the civil and parapublic market. This follows the company’s long-term commitment, made in 2015, to invest in increasing its industrialisation in the UK; an Airbus home country. “As a home country, it is Airbus Helicopters’ role to invest in current and future UK-based rotary wing solutions and technology for the benefit of customers at home and overseas; in this way helping to make the UK and Airbus Helicopters more competitive on the global market” said Colin James, Managing Director Airbus Helicopters UK. “Furthermore, by leveraging on our civil business know-how we are helping to drive efficiencies into the UK defence helicopter market” he added. 2017 has seen continued growth in the commercial market, including the export to an undisclosed European customer of two H125s in border security configuration, an area where Airbus Helicopters’ UK design team is recognised as having a world-leading capability. In addition, the company welcomed the order for four, heavily customised H125s for Qinetiq and which will be used as the new single-engine helicopter for the Empire Test Pilot School. The company also received orders for six new aircraft, a mix of single and twin-engine helicopters, in the private and business aviation segment, a core part of the company’s UK market and the result of the UK team’s expertise and offering in this sector. Since becoming the European hub for the newly launched Airbus Corporate Helicopters (ACH) last year, the company has set up an integrated sales network across Europe and inaugurated a new private and business customer facility at the company’s Oxford-based headquarters. The company’s success in the defence market was marked by achievements with UK Military Flying Training System (MFTS), where Airbus Helicopters UK delivered 25 H135 Juno – the highest number of H135s ever delivered to a single customer in a year. As aircraft service provider to UK MFTS, the company has now established its presence at RAF Shawbury, operating out of two hangars and where fully trained personnel are able to provide full maintenance and logistics support for the 29 H135 Juno helicopters. Similar facilities have been set up at RAF Valley to support the three H145 Jupiter helicopters based there. In addition, in late 2017 the company signed the £100m Puma 2 Follow-on Support Arrangement contract with the option for an extension until the currently planned out of service date of March 2025. 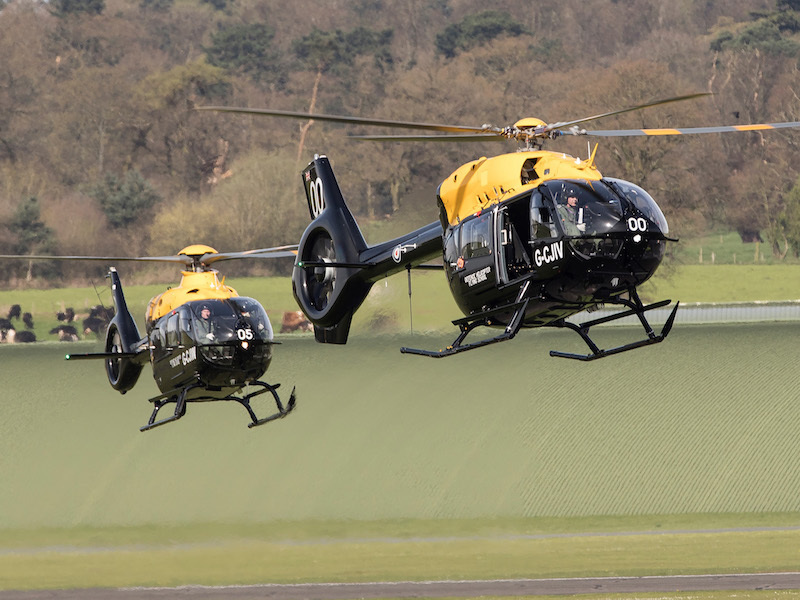 As a result, Airbus Helicopters continues to strengthen its partnership with the UK MoD, ensuring a strong and sustainable base for the future growth of Airbus Helicopters core activities in the UK. Since the company’s commitment in 2015 to increase industrialisation in the UK, Airbus Helicopters UK has expanded its teams, services and operations on all fronts. In support of the growing business and commitment to customers, the workforce has grown by more than 50% over the last four years. New services have been established to support maintenance for the latest, Helionix-equipped Airbus helicopters, while a new Helionix training simulator, at the company’s Oxford-based headquarters, helps pilots familiarise themselves with the full spectrum of advanced avionics and auto-pilot suite. Furthermore, following the launch of the company’s first UK research and development projects in 2015 (helicopter blade research through the Aerospace Growth Partnership and light, malleable armour through the Defence Growth Partnership), 2017 saw two new UK R&D projects approved, firstly on the use of virtual and augmented reality in maintenance operations and secondly on autonomous deck landings. The launch of these projects is scheduled for 2018 and will see Airbus Helicopters work closely with UK Government, industrial and academic partners to develop these capabilities. Today, Airbus Helicopters is by far the largest supplier of turbine helicopters in the UK including 100 helicopters operating with the Ministry of Defence, 100 per cent of the UK police helicopter fleet, as well as the majority of aircraft flying in support of the UK’s critical national infrastructure.